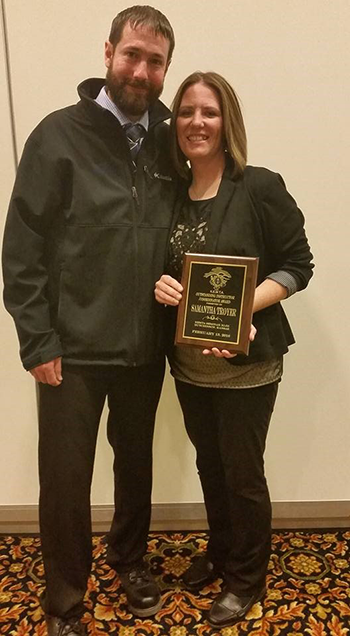 Samantha Troyer, Cowley College lead paramedic instructor, recently received the Kansas Emergency Medical Technician Association (KEMTA) Outstanding Instructor/Coordinator award for 2016. She received the award at the annual KEMTA conference banquet on Saturday, February 13. Chris Cannon, Cowley College Allied Health Department Chair and Director of EMS Education, nominated Troyer for the award. Troyer then goes on to explain how the pencil was harvested from a tree, which was planted as a seed and tended by a farmer, and on through the entire process of making a pencil. She then relates this back to how paramedics should view patients – not just as a disease, but as a person with many complex processes complicating their care. In addition to her educational acumen, Troyer is fiercely proud of EMS as a profession and strives to impart this passion for excellence to her students. She ensures professional behavior is as stressed in the program as studying and skills. “Sam is a great teacher and will represent KEMTA well as Educator of the Year,” Cannon said.